When configuring Ops Manager for VMware Pivotal Container Service (PKS) from an Authentication standpoint, you can either chose local authentication or use an external identity provider. The former means you are managing local users that reside within the User Account and Authentication (UAA) component of Ops Manager, which may be okay for a lab or proof of concept environment. However, for a Production deployment, most customers prefer to use their enterprise directory services which is typically Microsoft Active Directory. Ops Manager can integrate with a number of external identity providers as long as it can speak SAML. For VMware customers, the preferred identity provider solution is VMware Identity Manager (vIDM) which not only supports Active Directory, but can also support a number of other directory service integrations like Active Directory Federation Services (ADFS) as example. Since vIDM supports SAML-based authentication, we can configure Ops Manager to use vIDM which also means we benefit from all of the enterprise Single Sign-On capabilities that vIDM delivers, including things like multi-factor authentication which can provide an additional layer of security when connecting to your PKS infrastructure. Since there is currently no documentation on how to set this up, with the help of my colleague Blair Fritz and Assaf from the vIDM Engineering team, we have documented the process below which outline the required steps to integrate Ops Manager with vIDM. I had a question the other day on whether it was possible to enable shell access for Active Directory users when logging into the vCenter Server Appliance (VCSA) via SSH? The answer is yes and though this is documented here, it is not very clear whether this is only applicable to SSO-based users only. In any case, the process to enable this is pretty straight forward and simply requires two steps which I have outlined below. 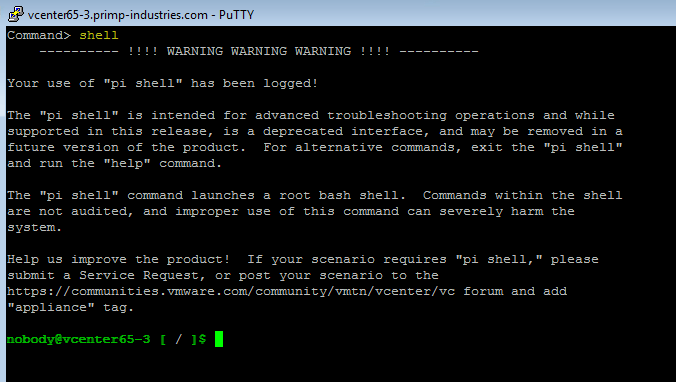 Step 0 - Ensure that your VCSA and/or PSC is joined to Active Directory before proceeding to the next step. If not, take a look at the documentation here for more details. Step 1 - Login to vSphere Web Client and under Administration->System Configuration->Nodes->Manage->Settings->Access, go ahead and enable boh SSH and bash shell options. The first setting turns on SSH to the VCSA and the second setting allows users (local, SSO and AD) to access the shell on the VCSA. Step 2 - In the vSphere Web Client and under Administration->Single Sign-On->Users and Groups->Groups, select the SystemConfiguration.BaseShellAdministrators group and add either an AD User and/or Group that you wish to allow to access the shell. Once you have completed the steps above, you can now SSH to your VCSA/PSC using the AD user (UPN format) that you had authorized earlier. In the example below, I am logging into one of my VCSA using user primp@primp-industries.com and as you can see, I am placed into the appliance shell by default. At this point I can access all the appliancesh commands just like I normally would if I had logged as a root or administrator@vsphere.local. If we wish to change to bash shell, we simply just type "shell" which will enable shell access, assuming you had performed Step 2. One thing that I noticed is that the default home directory for the AD user is /var/lib/nobody and apparently that does not exists by default, so users end up in / directory by default after enabling shell access. I am not sure if this is also related, but the username shows up as nobody as you can see from the prompt. This is something I will share with Engineering to see if we can improve upon as I am sure most of you would rather see the user that is actually logged in. The good news from an auditing and logging standpoint is that for operations that are logged, it does properly show the username even though the prompt is showing up as nobody. Last week a colleague of mines was setting up a new vSphere 6.0 environment which contained a vCenter Server with an external Platform Services Controller (PSC) for our Management vSphere Cluster and another vCenter Server also with an external PSC for our Compute vSphere Cluster. The PSC's were configured to replicate with each other which meant they were part of the same SSO Domain providing us with the new Enhanced Linked Mode (ELM) feature that was introduced in vSphere 6.0. With ELM, you can now easily view all of your vCenter Servers by logging into either of the vSphere Web Client Servers provided by any of the vCenter Servers that are connected to the replicated PSCs. In addition to providing a single view into your vSphere environment, data such as Licensing, Tags, VM Storage Policies, Roles/Permissions & Affinity/Anti-Affinity Rules to name a few are also replicated and made available to all the other vCenter Servers. As part of the initial setup, my colleague had joined the first PSC (psc-01) to our Active Directory domain after completing the deployment of the VCSA, as the vSphere Web Client was required to make further changes to the PSC. 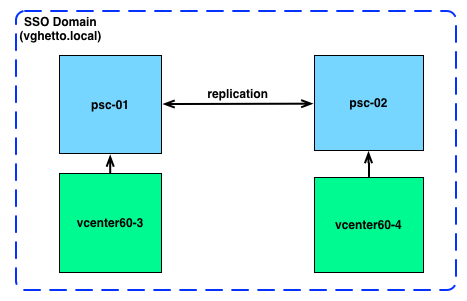 The question that my colleague had was whether or not additional PSC nodes were required to be joined to the same Active Directory domain or would it automatically be handled by the PSC replication? This was actually a great question and in fact something that could easily be overlooked or at least until you try to login using an Active Directory account and can not. What you will notice when going to the SSO Admin Configuration screen is that the Active Directory Identity Source has been added, so I can see why one would assume this would automatically be handled. If we take a closer look at my home lab environment and the Active Directory configuration within each of the PSC, we will see why this not the case. 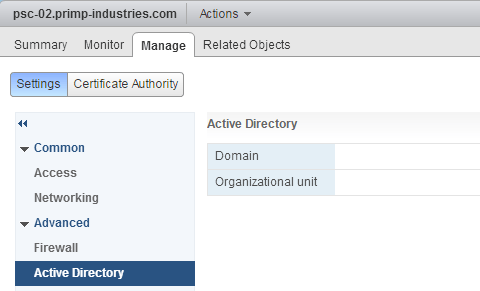 If we take a look at the Active Directory configuration for psc-01, we can see that it is part of our AD Domain and the "Join" option is grayed out. If we now take a look at psc-02, you will see that the Active Directory configuration is empty and the option to "Join" is still available. To resolve this problem, you just need to add the additional PSC nodes to Active Directory and then reboot for the changes to go into affect. The PSC's also support different Active Directory domains as long as a trust relationship exists between the two, for more details take a look at this VMware KB 2064250. It should also be noted that this should not be an issue for those deploying a Windows based vCenter Server since it is usually a best practice to joined the Windows system to an AD Domain prior to installing additional software on top.